Peak Trees has been established for 8 years and has gained international experience in the field of arboriculture. We have built a respectable reputation as one of Vancouvers leading fine pruning specialists and offer a quality service in Vancouver and the surrounding municipalities. Watch the timelapsed photography of an old Ash tree (Fraxinus excelsior) we removed. This is a great example of a tree which had out grown its location and was encroaching on the neighbours structural foundations. We offer a wide range of quality tree services from fruit tree pruning, tree removals, hedge maintenance and arborist reports. Please click the the link below to see our range. Have you experienced any damage in the recent snow and heavy rain? We can help mitigate the hazards from snow damaged limbs and collapsed hedges. In large trees it is often hard to see broken branches and they only become visible after a few months as they begin to brown. 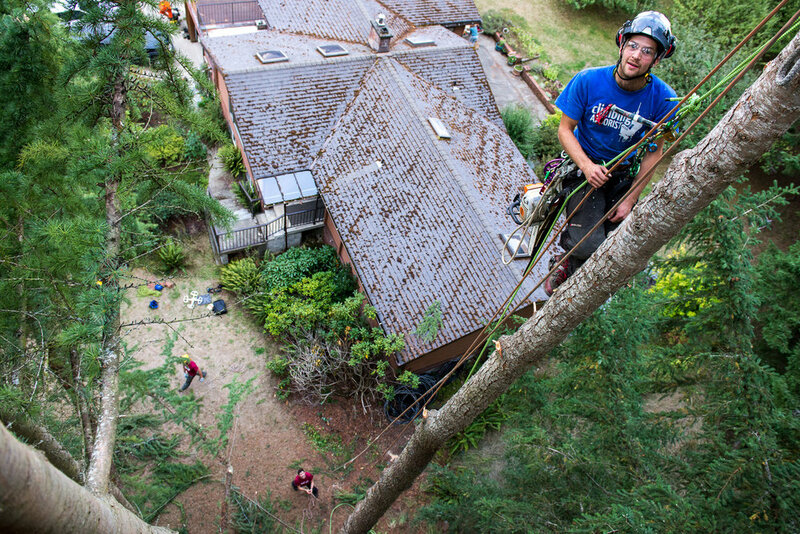 We are able to climb the trees efficiently and with non-invasive techniques to inspect any hazards. We always pride ourself on providing a high quality service to all our clients. If you would like to read some of our reviews, click on the link below! Mat began his career in arboriculture after securing a Bachelor of Sciences degree from the University of Sussex, England. Following this, he spent six months volunteering full time for the National Trust, a conservation charity focused on protecting historic buildings and green spaces. Having now acquired a taste for arboriculture, Mat pursued his passion with a small tree work company in the heart of England which further developed into establishing his own business - Peak Trees. At 24, Mat obtained a working visa for Canada in the hope of chasing his ambitions for the wilderness and interest in outdoor pursuits. During that time, obtaining a qualification of certified arborist through the International Society of Arboriculture. Mat also competes in the Pacific North West at the ISA climbing competitions. Taking a breather whilst the ground crew clear the drop zone. Mat keeps a close eye on his ground crew, especially when the tree removal is close to so many targets.